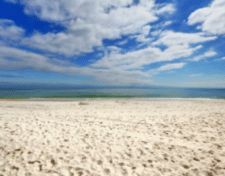 Perdido Key condo for sale at La Riva, a beachfront, low-density development situated on 520’ of sugar-white beaches. These luxury residences have a modern, open floor plan with spacious private balconies and incredible views. This east end beach home includes a private foyer-entrance from the elevator, opening into a large living area with incredible floor-to-ceiling window views from the living, dining and kitchen areas. The condominium has 10’ ceilings, with 4 bedrooms each with en-suite baths, plus a full-laundry room. The large gulf-front master suite features sweeping views of the Gulf of Mexico, a large balcony and spacious master bath. This is a rent restricted community with only 66 units within 3 towers – resort-style amenities include a gulf-front, heated indoor pool, an outdoor pool with a hot tub, steam and sauna area and an exercise facility – you have to come see this resort property!